Paul and Silas had been staying at the house of Lydia in Philipi. One day, they were on their way to prayer when they met a slave girl who had and evil spirit in her that caused her to give predictions of the future. She followed Paul and Silas around for several days, telling people that these men were preaching about the Most High God and proclaiming the way of salvation. Paul became annoyed and commanded the spirit in her to come out in the name of Jesus. The spirit came out right away. The man who owned the slave girl became upset because he saw that his chances of making money were now gone. So he dragged Paul and Silas to the city market place and started making accusations to get them arrested. Soon a mob of people joined in and attacked Paul and Silas until finally they were put into a cell, deep in the prison, bound up with chains and stocks on their feet. About midnight, while Paul and Silas were praying and singing to God, there was a violent earth quake. All the cell doors were opened and everyone’s chains fell off. When the jailer saw this, he was about to kill himself because he thought everyone had escaped. However Paul and Silas stopped him and assured him everyone was still there. The jailer then asked Paul and Silas what he needed to do to be saved. They responded, “Believe on the Lord Jesus and you will be saved!” They shared the gospel with the jailer and his family and they all became believers! They all rejoiced together. The next morning, when Paul and Silas were released from jail, they demanded to be escorted out and apologized to for the way they had been treated. After they left the jail, they said goodbye to Lydia and the other believers and left that town. 1. 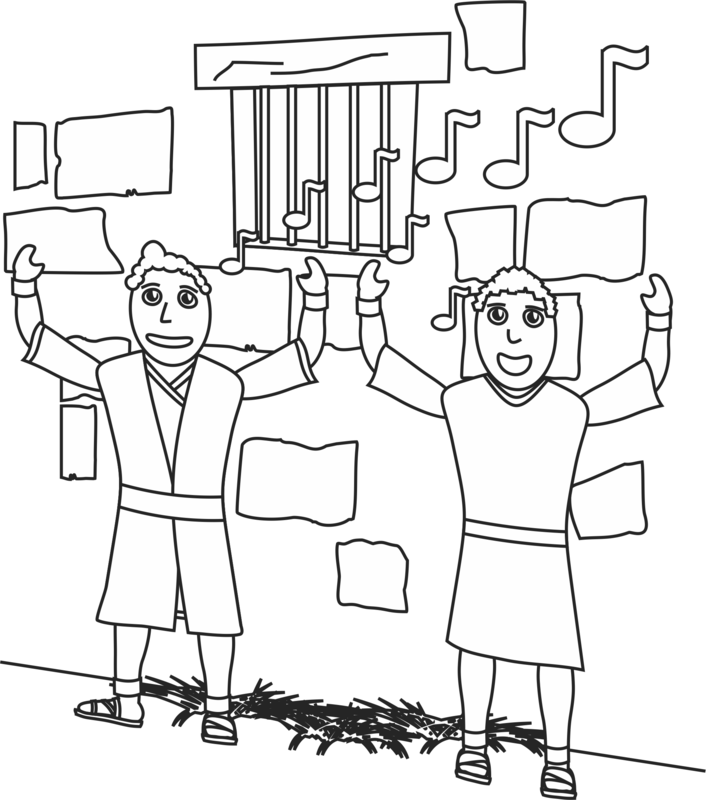 You will represent Paul and Silas imprisoned by wearing a paper chain on your hands. 2. Teach your children the lyrics and actions to the song “Deep and Wide”. 3. Begin by singing the song quietly and with small motions. 4. Repeat singing the song several times, each time growing louder and with larger motions. 5. On your last round of singing, break the paper chain on your hands while doing the motions. *Since the lesson this week is about freedom found when worshiping Jesus, take the time to teach your children some fun worship song. Use some of these, or some of your favorites, but make sure they have lots of fun motions to get the kids moving. Encourage them to express their freedom through their movements! The stars are his handy work, too. There’s nothing my God cannot do, for you! 1. Play this game as you would Red Light, Green Light. 2. You are the jailer. The children are the prisoners. 3. The goal of the children is to sneak their way to the jailer. When you say green light (and turn your back to them) they must sneak forward by tip toeing toward you. When you say red light (and turn to face them). They must freeze to avoid being ‘caught’ by the jailer. Anyone caught by the jailer must return to their cell (the start line). 4. Variations of this game can include crawling to freedom or having a path they must follow to escape. 5. After the first child has successfully reached you, they become the jailer and everyone else returns to the start as prisoners. Repeat as many times as time allows, until everyone has had a chance to be the jailer. 1. If using an empty tissue box, clear away any plastic from the opening. If using a shoe box, cut a rectangular hole in the lid, similar to a tissue box, and tape the lid to the box. 2. Cut a length of rope or sting that is long enough to tie around your waist. Tape the rope to the back of the box so that the middle of the rope is taped down and equal lengths of the rope remain on either side of the box. 4. Tie the box to your waist so that the box is facing out from your back side. 5. Jump and shake until the ball has worked its way out of the box. 6. The person who does this in the fastest time wins! 2. Using markers, write one word of the bible verse on each strip of paper. 3. Link the strips together so that the words of the verse are in order and each word is visible. Fasten the chain links together with tape or staples.